Sometimes the interests of rescue organizations are at odds with the interests of dog owners. Two recent cases demonstrate this antagonism that sometimes exists between the two. Sargent: Rescue Refuses to Return Iraqi War Vet’s Dog. 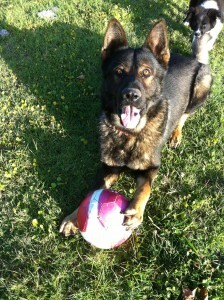 Sargent Playing with his Ball. Carlos and his wife had just moved into their first home and they were pregnant with their first child. This should have been a time of happiness and anticipation, a time to enjoy their last weeks as a couple without kids. Sadly, that’s not what happened. Carlos’s dog was at their relatives so their four acre yard could be fenced so it could be enjoyed by their dog. Sargent, a German Shepherd Dog, lives in the house but went outside in the yard, too. Carlos had received Sargent as a puppy when he returned from multiple tours of combat duty in Iraq. He named his puppy Sargent, his rank in the army. Sargent helped Carlos deal with the stresses of serving our country and was his constant companion. Sargent was discovered missing while he staying with relatives but there were no signs of him getting out—no gate opened, no digging, no fence in disrepair. It was believed that he might have been stolen. Sargent had a collar with his Rabies tag on it when he went missing. When Carlos found out Sargent was missing, he immediately left work and started searching for his dog with his entire family. They had numerous lost dog signs printed and posted them wide and far. They networked with the shelters in the county where they lived—went there looking, called and provided flyers with Sargent’s photo—to no avail. They also scoured the Internet looking. Unbeknownst to Carlos, Sargent ended up over 25 miles from where he started and into another county. He was on the loose around 5 weeks before he was taken in by animal control where he stayed for another 3 weeks. Sargent was turned in with his collar on but his tag was missing, the tag ring still on the collar. Carlos had been continually searching at all the shelters in his county but had no idea his dog had ended up so many miles away and in another county. Sargent was transferred to Greater Houston German Shepherd Dog Rescue and was eventually posted on their website. Carlos never gave up looking for Sargent and that is why he saw his dog on their website. Carlos and his wife contacted the rescue to get Sargent back to no avail despite producing records and photos that matched. A rescue volunteer suggested that they go to Petco at an adoption event to get their dog back. They did. Carlos tried to get his dog back at the adoption event as suggested by the rescue’s volunteer but the rescue refused to return his dog despite being provided veterinary records showing that Sargent was fully vaccinated, had a current Rabies shot, was heartworm negative and negative for other parasites. 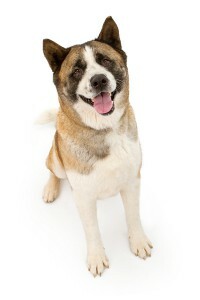 They also took photos proving this was their dog which was not in issue. The rescue flatly refused to return the dog regardless that Carlos offered all expenses and an adoption fee. In fact, he applied to “adopt” his own dog back but the rescue refused. Carlos even explained that he was an Iraqi war vet and Sargent had been given to him as a puppy to help with the stress of multiple tours of combat duty. The rescue would not budge. Carlos’s wife was then 8 months pregnant and was sobbing, but the rescue would not budge. The rescue told Carlos that he failed to produce puppy records so he could not get his dog back. “His original owners showed up at Petco today, let me tell you about a nightmare I had to deal with. A dog who was in animal control for 4 weeks* and was saved by us. They had excuses for everything and no proof they are good owners. ** I thank god I have ____ and ___backing me up on this one! *Animal control actually had the dog for 3 weeks and the dog had ended up in another county 28 miles from where he started. **Vet records were produced showing the dog was fully vaccinated, heartworm negative and negative for other parasites. This Facebook post was deleted and Sargent disappeared off the rescue’s website. Additionally, the rescue went private on Facebook for only approved people after receiving many posts about Sargent. All attempts to get Sargent back failed. Suit was filed and the dog was returned to his rightful owner. This case concluded recently without a trial. It was contended by the rescue that Sargent had heartworms but the owner had veterinary records showing Sargent tested negative. He was receiving heartworm preventative but the dog had been missing for around 5 weeks before he ended up in animal control. Monte: Rescue Refuses to Return College Kid’s Family Pet. 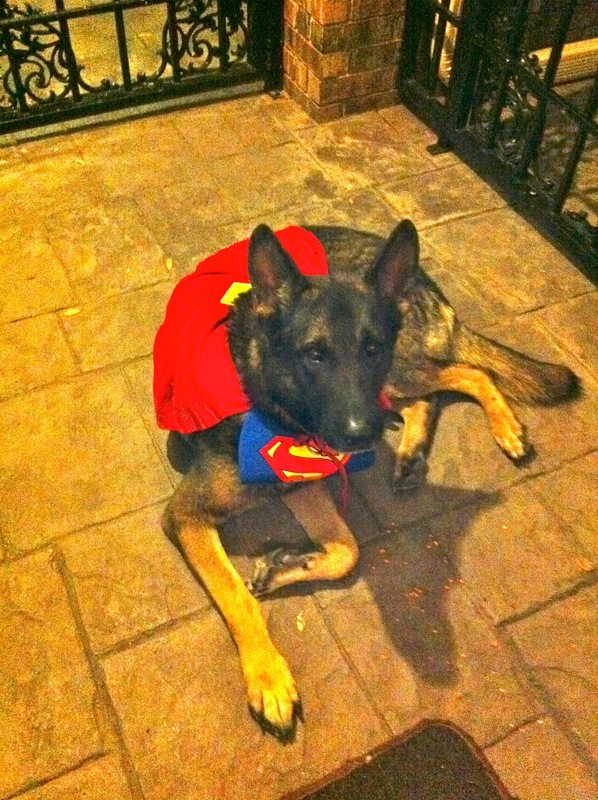 Monte in his Super Dog costume for Halloween 2 months before he accidentally got out. Monte accidentally got out the evening of January 1, 2013. Lily, a college student, immediately started searching everywhere for her family pet. She posted signs offering a reward in the neighbor, at vet clinics and local businesses. She posted him on numerous lost dog websites and searched websites for found dogs. Monte was turned into BARC on January 2, 2013. Within 24 hours of him being there, Lily went to BARC on Thursday morning, January 3, 2013, but she learned en route that BARC was closed to the public for reclaiming pets (BARC is open limited hours for citizens to redeem lost pets). She called BARC to make sure and they told her they were closed but to look on Pet Harbor because they post all dogs that come into the facility on that website. Lily did exactly what she was told and searched on Pet Harbor. She saw two dogs that looked like hers so she went to Harris County Animal Control and Montgomery County Animal Control, but these were not Monte. She went to the Houston SPCA because they don’t use Pet Harbor. Unbeknownst to her, BARC had listed Monte by the wrong breed. He is a German Shepherd Dog but was listed as a Belgian Malanois by BARC so that accounts for why she never found her dog on the website. She continually searched and followed up on replies to her posts. She learned from someone that her dog was indeed at BARC, so she raced to BARC (seven days after Monte was lost) only to find that he had been transferred to the Greater Houston German Shepherd Dog Rescue a day and a half before. BARC gave Lily the name and number of the rescue volunteer who had transported Monte. She immediately contacted the rescue for the return of her family but they refused to return her pet. Her brother called. No, they would not return the dog. All expenses were offered but the rescue refused to return Monte. Monte is an 8 year old dog that Lily and her family has owned since he was 8 weeks old. Monte was current on all vaccinations including his Rabies shot. He is an inside dog and wore a collar with his tag when leashed for walks. He has a thick mane and he would get out of his collar. He did not have his collar on when he got out. A door was left open to the garage and he wandered off. Monte had never gotten out before. There was actually a wall that encircled the yard and pool where he lived so there was not a fence in disrepair. Monte had tested “weak” heartworm positive and was being addressed by his own vet. He was on Heartgard. The vet said they would retest at his next visit. In fact, BARC used to adopt out mild heartworm dogs with a handout on using Heartgard or Ivomec as a soft treatment. Many rescue groups use a soft treatment (slow kill) for heartworms and simply give the dog Heartgard. The medication is not foolproof. Heartgard had to remove that from the labeling in 2008 per the FDA because dogs can still test HW+ even with correct usage. Houston’s weather makes mosquitoes a huge issue. Heartworms are introduced in dogs by mosquito bites. Heartgard kills heartworms but does not prevent mosquitoes from biting the dog and introducing the parasite into the dog. Additionally, heartworm tests can produce false results. Monte is an inside dog that sleeps in his owner’s bedroom. The photo of Monte was taken on Halloween, two months before someone left a side door to the garage open. He weighed around 100 pounds at 8 years old. He was in his Super Dog costume and helped give candy to kids on Halloween. When all efforts failed to get Monte back, his owners sued. After a two day trial, the judge ruled that Monte should be returned to his family and that there are no state or local laws that served to extinguish the owners’ rights in their dog. This case has been appealed by the rescue who is still trying to take Monte away from his owners. Importantly, not all rescue organizations refuse to return pets to their rightful owners. Many do and enjoy the reunions filled with leaping, wagging and lots of kisses. If a dog is reclaimed by an owner, then another one can be saved. Rescue groups are not trying to keep the dogs from themselves, but are placing them into new homes. Why not place the dog back with the family he has known all his life? Why tear apart a family who has been desperately searching for their pet? Some rescue organizations have complained that if they have to return dogs to their owners, this will have a chilling effect on rescues pulling from shelters like BARC and live release rates. Interestingly, Monte and Sargent were returned to their owners in early 2013. Yet in 2013, BARC has had its best live release rate in its history and touts that more dogs are pulled by rescue organizations than ever. In fact, in January and February of 2014, BARC’s live release rate has been almost 72% which is the best rate ever even topping 2013. 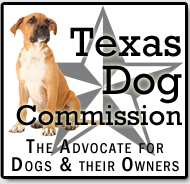 There is no state law that divests ownership in dogs because they have been in an animal control facility. State law that empowers local governments to impound dogs is for Rabies control, not taking pets away from their owners. It is not easy to find dogs in a large metropolitan city like Houston. Harris County has 35 cities all of which have responsibility for animal control and multiple shelters. While animal control is the only agency empowered to impound dogs, as a practical matter, others take in dogs all the time. Other shelters, rescue groups and Good Samaritans take in dogs. There is no central location for dogs nor is there a central website for lost dogs. Dogs that get out lose tags, collars come off and sometimes dogs are stolen and then later escape. Microchips deactivate, gravitate and oftentimes not properly scanned. Sometimes, they are ignored. Dogs travel and end up miles away from where they originated. There are many reasons that people do not find dogs during a very short hold period. John Q Citizen is not necessarily rescue savvy so they have a real learning curve when trying to find a lost dog. Plus, many people are unaware of the volumes of dogs that animal control impounds and the many mistakes that are made. Question: “My question is, if your dog got out, would you want it back? Yes or no? What happened to the Golden Rule? Harsh laws, that purport to take away dog owners’ rights after a short hold period serve to hurt good owners who are desperately searching for their pets. Bad owners don’t bother. These cases illustrate how some rescue organizations and owners find themselves at odds. Unfortunately, it is usually the animals who pay the price for that. All of the time, energy and money expended in these cases could be better used saving more animals. This entry was posted in Cases, Dog Law. Bookmark the permalink.